Poinsettias (Euphorbia pulcherrima) are popular potted plants, particularly during the Christmas season. Brightly colored and mostly red, a Poinsettia provides effective color in home decor during and after the holiday season. The newer Poinsettia cultivars are long-lasting in contrast to the cultivars that were available a few years ago. Christmas charm is what these amazing Poinsettias hold. The bright petals of Poinsettias, which look like flowers, are actually the bunch of upper leaves of the plant, called bracts. Poinsettia flowers are small, green or yellow, and grow inconspicuously in the center of each leaf bunch. Poinsettias are sub-tropical plants and therefore wither if the night temperature falls below 10 degrees C (50 degrees F). The day time temperatures in excess of 21 degrees C (70 degrees F) shorten the lifespan of Poinsettias. In colder climates, Poinsettias are grown as indoor plants. As indoor plants, Poinsettias need exposure to the morning sun and shade during the hotter part of the day. Poinsettias are one the most difficult to reflower after the initial display when purchased. Poinsettias need a period of uninterrupted long, light-free nights for about two months in early spring in order to develop flowers. Poinsettias are the most popular of the holiday plants. Poinsettias are native to southern Mexico and Central America. Poinsettias also bloom in cream, lemon, peach, pink colors and with white and gold-splashed leaves. Poinsettia's botanical name, Euphorbia pulcherrima, means "the most beautiful Euphorbia". Poinsettia was named after the former US ambassador to Mexico, Dr. Joel R. Poinsett who introduced the Poinsettia to the United States. Recent research has proved that Poinsettias are not poisonous. Poinsettias, at times, reach a height of sixteen feet. Poinsettias are also known by other names such as 'Christmas flower', 'lobster flower', and 'Mexican flame leaf'. As a result of its importance in the celebration of Christmas and its beautification of America, December 12th is celebrated as National Poinsettia Day, to honor the passing away of Joel R. Poinsett. The ancient Aztecs (the Mexican Indians) prized the Poinsettia as a symbol of purity. Centuries later, Mexico's early Christians adopted the Poinsettia as their prized Christmas Eve flower. 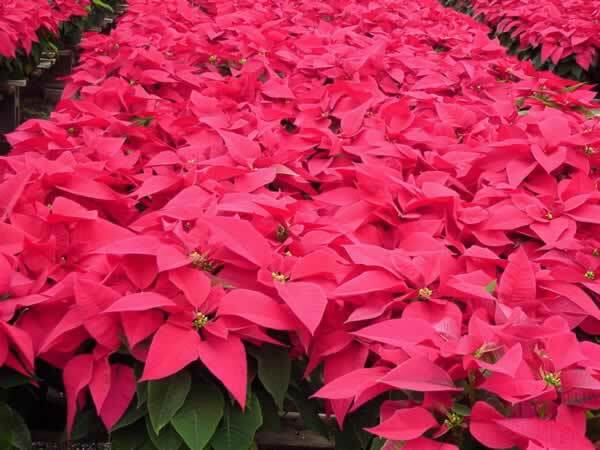 The Mexican Poinsettia, known as the Christmas flower in North America, is used in most Christmas decorations, owing to its bright red color and its blooming season coinciding with the Christmas holiday season. The Mexican poinsettias are commonly bright red. For some, these star-shaped bracts symbolize the Star of Bethlehem. The Christmas Poinsettia flowers have become a symbol of Christmas and are used as festive decor. A Mexican legend explains how Poinsettias came to be associated with Christmas. Apparently, a child who could not afford a gift to offer to Christ on Christmas Eve picked some weeds from the side of a road. The child was told that a humble gift, if given in love, would be acceptable in God's eyes. When brought into the church, the weeds bloomed into red and green flowers and the congregation felt that they had witnessed a Christmas miracle. As the poinsettia is one of the most popular potted plants, you may want to purchase one as a gift. They now come in a wide variety of colors, sizes and shapes. Shop poinsettia plants. It is probably best to start cuttings from the original Poinsettia plant, which would then develop into sizes you are normally inclined to purchase at Christmas. In July or August remove three- or four-inch cuttings from the new Poinsettia growth on the plant. Insert each Poinsettia cutting in a small pot containing a sterilized mixture of half sand and half peat moss. Keep the Poinsettia cuttings shaded and watered during the rooting period for about three weeks. Then set the Poinsettia plants in larger pots in a sterilized mixture of equal parts of soil or sand, peat moss, and perlite. The soil in which poinsettias grow should be kept moist at all times, but not excessively wet. Avoid placing poinsettias in areas which receive air movement from windows, doors, fans, or radiators exists. If placed in such locations, they cause premature flower, bract, and leaf drop. Keep your Poinsettia plant near a sunny window where it will have the most available sunlight. Sunlight should be available for the Poinsettia for at least five hours a day. A window that faces south, east or west is the best location to place your Poinsettia. Do take precaution that no such part of the plant touches the cold windowpane which may injure it. Let not the soil in the Poinsettia pot dry out. If you feel dryness of the soil on touching it, do water it until it runs freely out the drainage hole in the container. The pot should be able drain the excess water as waterlogging in the pot is not good for Poinsettia. Waterlogged soil lacks sufficient air, which may result damage of roots. Poinsettias exposed to high light and low humidity require more frequent watering. Maintain the temperature of the location at 65 to 70 degrees F during the daylight hours for Poinsettias to maintain its blooming in a good stead. It is a good practice to move Poinsettias to a cooler place at night but it is not a demanding criterion. Because root rot disease is more prevalent at temperatures below 60 degrees F, do not put the poinsettia in a room colder than this. Poinsettias form flower buds when the days are shorter than 12 hours. Get your Poinsettias to bloom by dark treatment of Poinsettias! Beginning the first of October, protect the plants from light by placing them in a dark closet between 5:00 PM and 8:00 AM daily. Exposure to even the slightest amount of artificial light during this period will inhibit flowering. After 40 days of this treatment, the plants can be kept in normally lighted rooms. With water, fertilizer, and 60-70 degree F night temperatures, the plants will flower during December. After the plants begin to drop their leaves, withhold water to encourage dormancy, and store in a cool location (50-60 degrees F).